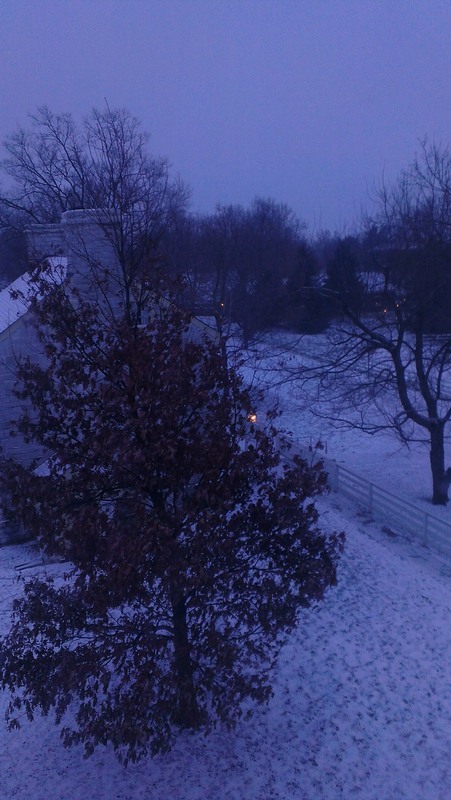 The view from my bedroom at Pleasant Hill, about 7 AM on a cold, snowy morning. My mother’s birthday is in early February. Since that usually coincides with the end of the run of whatever holiday show I’ve booked, my practice is to take a few days and drive down to northwest Tennessee. I celebrate Mom’s birthday with her, visit my sister Joan and her kids, maybe see my Aunt Julia who lives a few hours away. I always enjoy the trip except for the drive, which involves about ten and a half solid hours in the car, mostly on interstates, with very little scenery and no time to stop even if there was something to see. This year I decided to shake things up a little and go a different route. Normally I go south through Virginia and then west through Tennessee to get to my mom’s, but this time I decided to go through West Virginia and Kentucky. I knew it would add another hour to my travel time, but I thought it might be fun to break the trip halfway and stop overnight someplace. That would give me time to do a little sightseeing on the way. I started doing a little internet research but kept coming up with chain hotels and the same old/same old B&Bs. 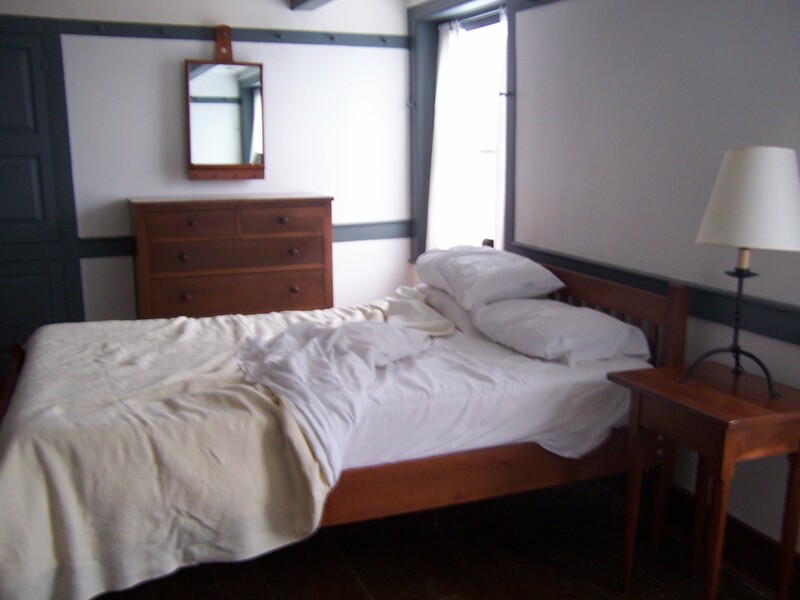 Then I stumbled on the Shaker Village of Pleasant Hill. It’s in Harrodsburg, KY and was a little further down the road than I had originally planned to go on my first travel day, but the more I read about it, the more intrigued I became. The Shakers, or as they call themselves, the United Society of Believers in Christ’s Second Appearing, is a religious sect started in the mid-1700s with an emphasis on ecstatic worship services, a celibate communal life, equality of the races and sexes, hard work and craftmanship, and the belief that doing something well was, in itself, an act of prayer. The settlement at Pleasant Hill was established in 1805 and thrived for nearly fifty years before the post-Civil War industrial revolution changed both society and the economy. After a long, slow decline, the settlement closed its doors in 1910, but restoration work began in 1961 and the site today features 36 of the original 260 structures built by the Pleasant Hill Shakers. As one might expect, Pleasant Hill is most popular in warmer months, but even in February one can stay in one of the restored buildings. I was able to book a room in the West Family Dwelling (with private bath) for a single night at a cost that was in line with rates at chain hotels in the nearby Lexington area. The Winter Kitchen, located in the basement of the building, is open for breakfast, lunch and dinner, so I made a dinner reservation as well, packed my stuff in the car and on a cold and blustery morning, headed out. My Shaker reproduction bed, complete with Tempur-Pedic mattress. I had some delays along the way and ended up driving the final miles of the trip down a winding back road in the dark, so I was grateful when I arrived at the village entrance. 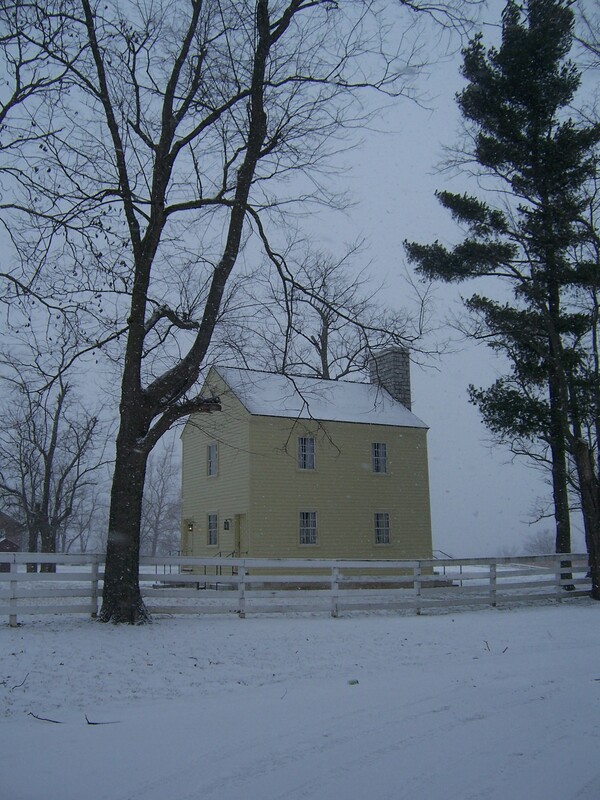 I had to drive to the Trustees’ Building to check in, then drive to the West Family Dwelling. I’d asked for a quiet room with a pretty view, which meant I was on the third floor, but I knew this in advance and had packed an overnight bag just for this leg of the trip. I hurried up all the pretty staircases, stashed stuff in my room and then ran downstairs just in time for my 7:30 dinner reservation. The cozy Winter Kitchen serves a limited menu – only about three or four choices – so I decided on the country tart, which turned out to be a sort of vegetable quiche. 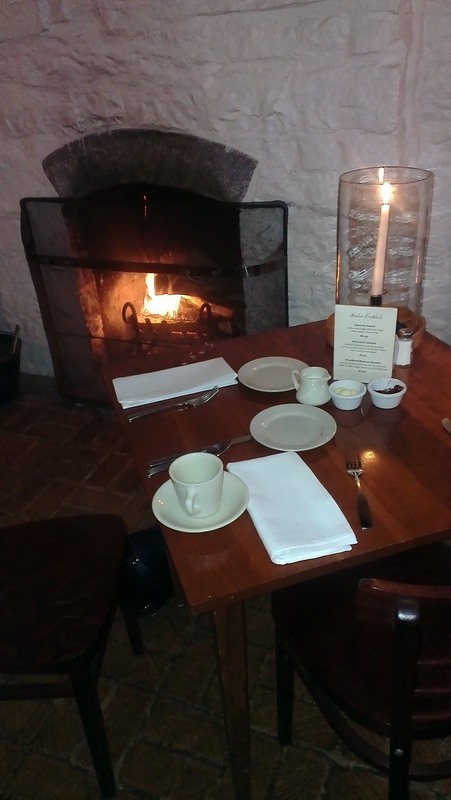 I like quiche, they had some nice wines to choose from and my little table was near the hearth with a good fire, so I was happy. A dozen or so Mary Kay ladies had a large table near me and their makeup chatter didn’t really go with the ambiance of the place, but I was still in a good mood when I climbed the steps to my room once more. There was a little TV in a Shaker-style cabinet in one corner of the room and a little rocking chair to watch it from, but I opted to unpack the travel laptop and try to get some work done before I went to bed. Unfortunately the wi-fi reception in the room was spotty so I gave up after a while. I wanted to get in some sightseeing time in the village before I left in the morning, so I had a shower, set my alarm (I had an 8 AM breakfast reservation), read for a while and then turned out the lights. In addition to the Mary Kay ladies, there was some meeting of college-age girls going on in the building and I heard the occasional outburst from them, but by and large the place was lovely and quiet and I slept well. My breakfast table in the Winter Kitchen. In the morning I had a surprise – snow! (See the first picture above.) It was so pretty, but I could tell it was going to be a cold, blustery morning and was glad I’d packed warm clothes in my overnight bag. I got dressed and went downstairs for breakfast and was just about the first one there, so I got my pick of tables. Of course, I chose the one right by the hearth and it was delicious to sit there sipping tea and eating biscuits with the crackling fire so warm and close. Breakfast itself was nothing to write home about; on the weekends they do a buffet-style thing and the reconstituted eggs and bacon in warming trays weren’t very appetizing. They also had pastries and oatmeal and cold cereal, just like any chain hotel’s free breakfast. I filled up on biscuits with butter and jam and lots of hot tea, then ran up to my room for my luggage. I packed the car and brushed about two inches of soft, pretty snow off the windshield, et al, and then drove over to the main parking lot and left the car there. It was snowing pretty hard but I was warm and full of breakfast so I walked over to the Trustees’ Building to check out – maybe a quarter of a mile. The nice lady who checked me out seemed surprised that I wanted to buy a ticket to tour the village, but she assured me that many of the buildings would be open at 10 AM and I was free to stroll around as I liked until then. Pleasant Hill has a kind of Colonial Williamsburg vibe going on, but I expect that even on busy days it’s nowhere near as crowded as C.V., and this was definitely NOT a busy day. In fact, I had the whole place pretty much to myself. I’m not all that hepped on the insides of old buildings but I do enjoy the outsides and it was fun to trudge down the deserted village streets with the snow scrunching under my boots and the wind whipping around my face. I had a fleece headband as well as my jacket hood to keep me dry and relatively warm, and I also had a map of the place the nice lady had given me. I discovered that there were working farm buildings in the eastern half of the village, so I hiked off in that direction. Soon I saw a large black barn in the distance and as I got closer, saw a pen full of frisky goats having their morning constitutional. I went over for a visit and was joined by a large and insistent cat. 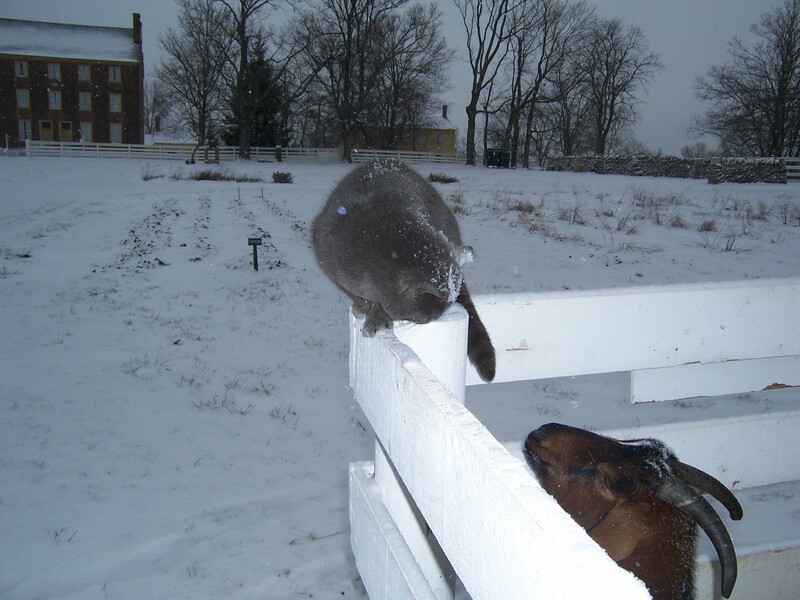 Everyone was covered in snow but still friendly enough; the goats kicked and capered and tried to nibble my coat through the fence and the cat positively yowled until I petted it (and then got so excited that it tried to bite me, fickle creature). 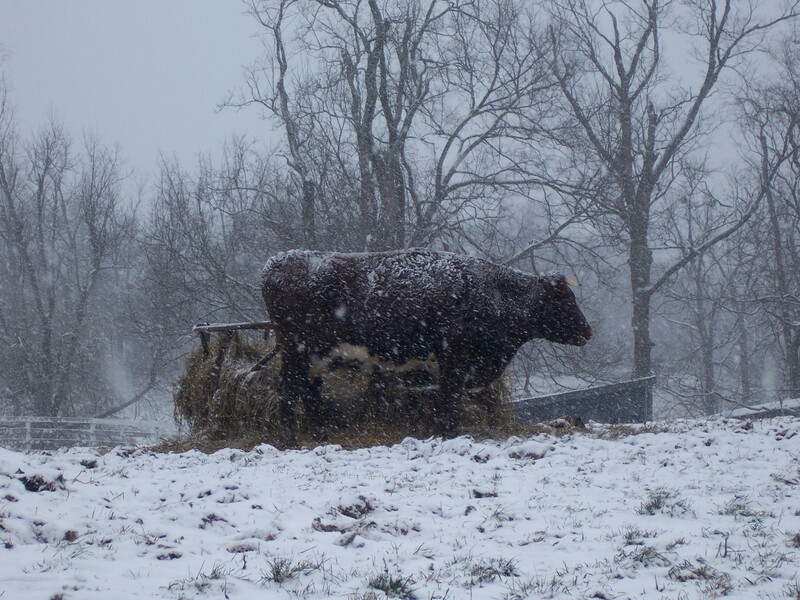 I spent a good long while playing with the goats and then moved down the road to a turkey pen, with a single large tom turkey in dignified residence, and then further still to snow-covered pastures lined with stone walls, where a lot of cattle were standing patiently, their hides frosted white. It was nearly 10 AM by then so I mushed back to the Visitors’ Center. The gift shop was just opening so I had a look in there – the prices were jaw-droppingly high – and then strolled down the village’s main drag to the Centre Family dwelling, which is used as a museum. A pair of lovely elderly ladies in Shaker garb were doing the docent thing while ironing shirts and doing other picturesque things. They were pleasant enough but seemed content to leave me to my own devices, so I went up and down the staircases, snapping pictures to my heart’s delight. So many pretty windows with lovely snowy views. 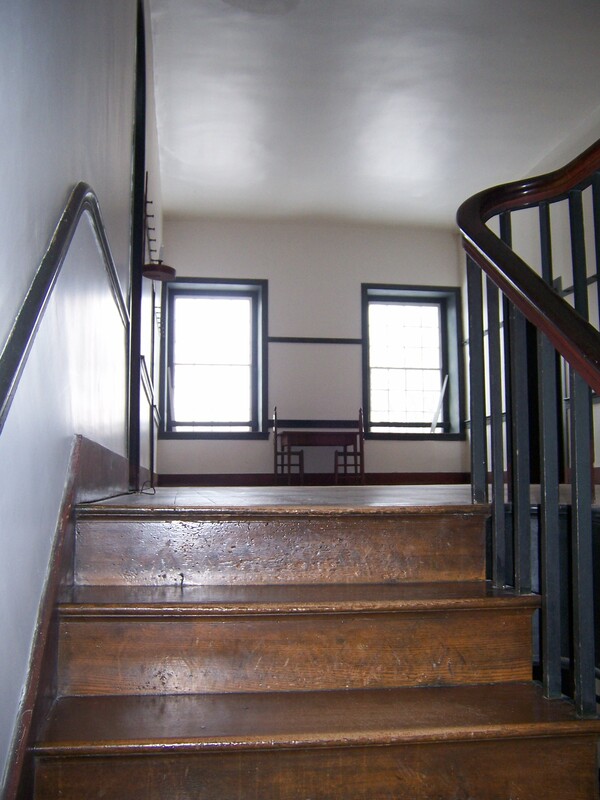 Going up the stairs to a spare and pretty Shaker hall. I went back outside and noodled around some more. 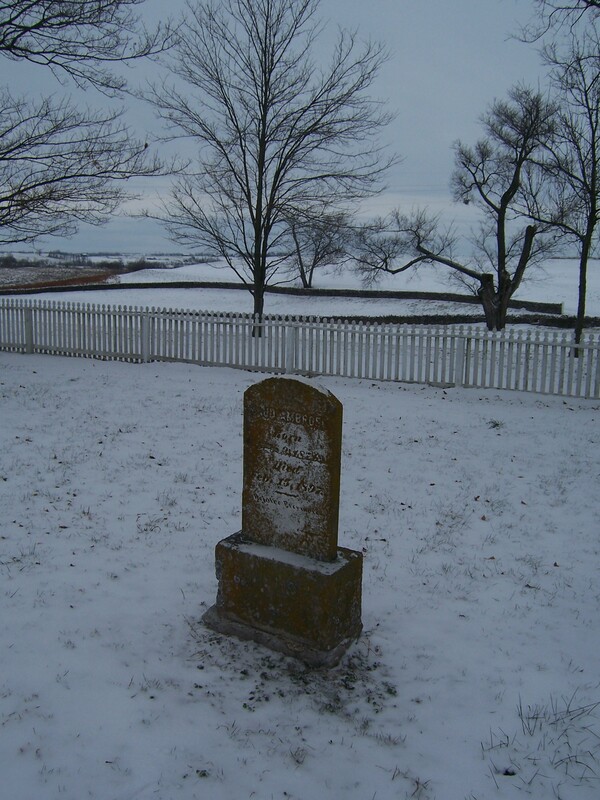 Signs led me to the eastern section of the village and the little Shaker graveyard, which was particularly poignant in the snow. I saw some geese in a half-frozen pond, many more cattle and some donkeys sharing some hay with a few sheep. I also finally began to see other people; a few brave folks were out wandering like me, but mostly people seemed to be shuttling between their cars and the West Family Dwelling. The snow was letting up but it was still blustery. 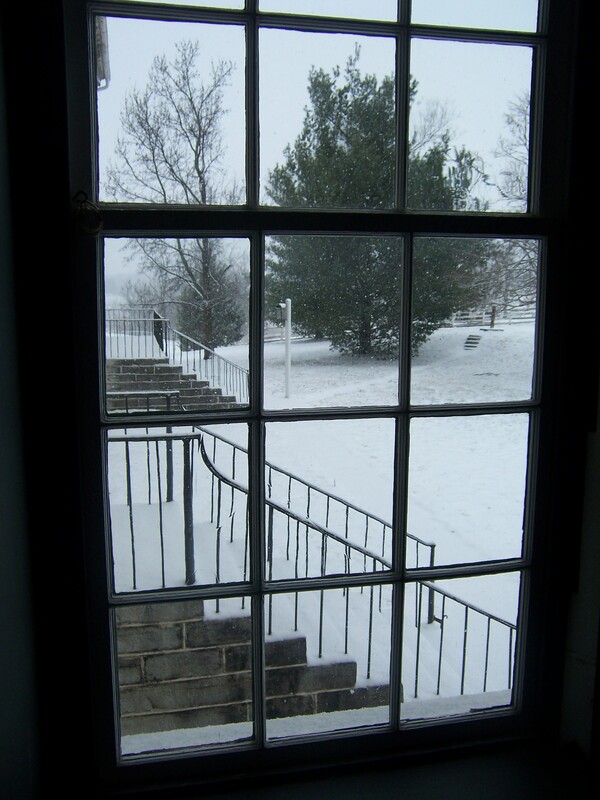 I knew I had another three or four hours to travel to my mother’s house, and I also knew there was another Shaker village I wanted to visit along the way, so reluctantly I went back to my car, brushed off the fresh accumulation of snow, and pointed my nose to the southwest. I’d like to go back to Pleasant Hill one day – maybe in the autumn. I bet it’s gorgeous in the autumn. But Pleasant Hill in an early February snowfall is pretty darned magical. One of the restored buildings. View of the pond and the fields beyond. 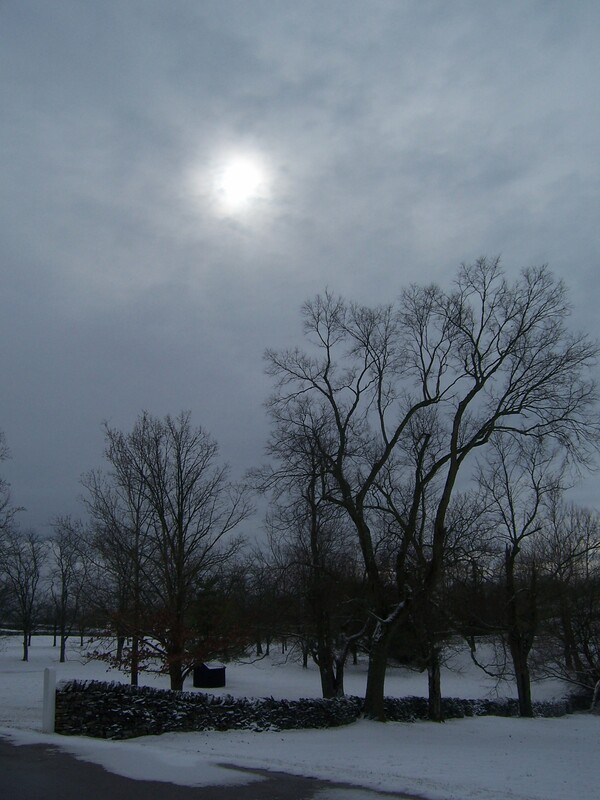 The snow is letting up and the sun is trying to peek through the clouds as I get ready to leave Pleasant Hill. I’m at work so I can only skim this for now–but wow!! Sounds like a dream place! How interesting! What a good idea to try a new route – a nice thought when not just trying to “get there” as we so often are in such a hurry. Glad you had an adventure. Great post and gorgeous photos. Will have to make our way to this area some day. Thanks for sharing these lovely photos and comments! 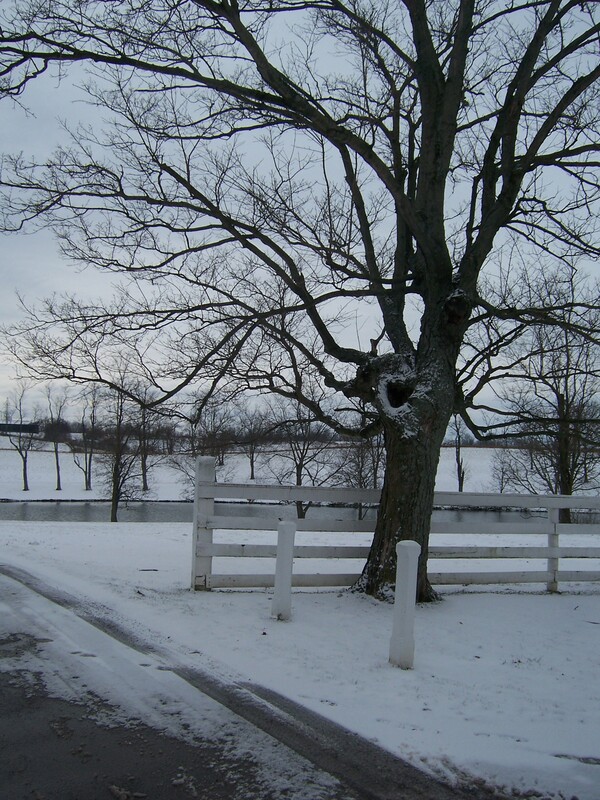 We have lived in the beautiful bluegrass for 20 years and Shaker Village is a favorite destination. Glad you enjoyed the photos and post, Margo!